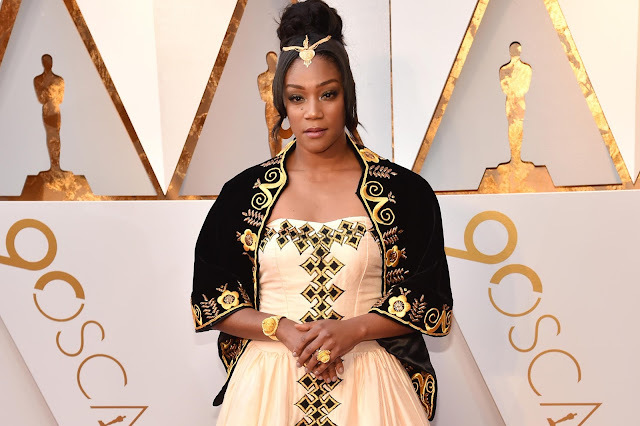 It took years for Tiffany Haddish to find her Eritrean father, Tsihaye Reda Haddish, after a turbulent childhood that includes foster care. She didn’t give up her search and was happy to be reunited with him and connect as a young woman. Although everything between them wasn’t always smooth sailing, they established a relationship until his untimely death last year just as her Hollywood star was rising. Tiffany first honored her father by visiting Eritrea earlier this year for the first time. She promised the country that she would ensure that everyone knew about Eritrea and its beauty. Tiffany honored her father and Eritrea at the 2018 Oscar Awards where she was a presenter by keeping her promise; she wore a traditional Eritrean gown called a zuria/habesha kemis - a cream gown with a fitted bodice and full skirt, plus a black cape with black-and-gold embroidery to the ceremony. Oscar season is a time for designers to dress top starlets in their best and I have no doubt that big name designers had Tiffany at the top of their lists to dress for this big night. The fact that she decided instead to dress in a traditional Eritrean gown and look regal while doing so just makes me love and respect her so much more. As she made her rounds down the red carpet, Tiffany explained the importance of her gown to interviewers by saying, “My Father is from Eritrea and he passed away last year and he said one day I would end up here and if I ever end up at the Oscars to honor my people so I’m honoring my fellow Eritreans.” Tiffany looked so regal and was the talk of the evening. Of course she had to keep her funny girl bone going and came out with Maya Rudolph to present two awards in the same white $4,000 Alexander McQueen dress she wore to the Girls Trip premiere and as the host of Saturday Night Live with house shoes on and her heels in her hand because her feet hurt. She did tell us the dress cost more than her mortgage and she was going to wear it as many times as possible. Clearly, our girl did not lie and her word is bond on all things. Did you love Tiffany's gown and the reason she wore it?